NIAGARA-ON-THE-LAKE, Ontario — Tell someone you’re heading to Niagara, and she’ll probably think of one thing: the fabulous falls straddling the Canadian and U.S. borders that draw more than 20 million visitors a year. Been there, done that. Time for a new adventure. Less than 10 miles north of the steel arch bridge that transports visitors over the Niagara Gorge and into Ontario lies a village so quaintly picturesque that if you saw it in the movies, you’d assume its perfectly landscaped streets and gracious Victorian architecture were the work of a set designer. In reality, this small town of 14,000 nestled between Lake Ontario and the limestone Niagara Escarpment — recognized as one of the world’s natural wonders — has been charming travelers for almost 200 years. Cultural types have flocked here since the early 1960s for the unparalleled theater experience known as the Shaw Festival, held from the beginning of April to the end of October. But the town also appeals for its history. Settled by loyalists at the end of the American Revolution, it was a strategic hub for British soldiers during the War of 1812. American troops burned the town to the ground after Fort George was captured in the spring of 1813. Yet it quickly reinvented itself as a shipping and ship-building center, and the elegant Georgian homes that line its streets speak to the prosperity of the enterprising souls who brought the town back from the dead. Fall also marks the start of the abundant grape harvest. Thanks to its moderate climate, the town in the past 20 years has grown into a major viticultural region, with more than 20 wineries in four distinct growing areas in the Niagara Peninsula producing terrior wines. Of particular interest is its icewine, made from grapes that remain on the vine long after the harvest and are then picked by hand at night and pressed while still frozen. When grapes freeze and then thaw, the fruit dehydrates, concentrating its sugars, acids and extracts. The result is an intensely flavored wine that can cost $50 or more a bottle. 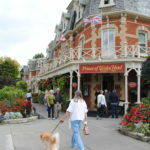 Niagara-on-the-Lake is a small enough town that you can easily explore all of its nooks and crannies by foot, so long as you remember to pack a pair of comfortable shoes and, if you plan on patronizing the chichi shops on Queen Street, a handful of cash; most are pretty precious. (The exchange rate for the Canadian against the U.S. dollar is almost even, so you don’t really have to worry about changing money.) I spent an entire morning wandering from one quaint store to the next, stopping along the way to peer in the window of the Niagara Apothecary (an authentic museum restoration of a 1869 pharmacy, open weekends only in fall), and to watch kids splash their hands in a fountain bearing a statue of the playwright Shaw. I also wandered down Regent Street for a closer look at the Niagara-on-the-Lake Lawn Bowling Club, whose iron gates and manicured lawn I’d passed during a pre-breakfast run. It was established in 1877, making it the oldest still operating in Canada. After watching a pair of bowlers take some shots, I continued my stroll through Queen’s Royal Park, where from the gazebo you have a fabulous view of Fort Niagara across the blue-green waters of the Niagara River. If you’re looking for a more structured walkabout, Old Town Tours offers a 90-minute guided tour through the historic district at 10:30 a.m. and 4 p.m. daily through October ($20 adults/$10 children). It’s also possible to take a horse-drawn carriage ride through town and along the waterfront; tours start from in front of the Prince of Wales hotel (prices range from $70 for a 30-minute ride to $130 for 60 minutes for up to four adults and two children). If my teenaged girls had been along, I probably would have splurged on the elaborate ritual of English high tea at the luxurious Prince of Wales. (The hotel offers four options, ranging in price from $32 to $45 per person.) Flying solo and wearing jeans, though, I was too intimidated by the opulence of its Victorian drawing room. I satisfied my afternoon munchies with a croissant from Niagara Home Bakery. Towns ravaged by war often have spirits associated with them, so rather than do a regular tour of the rebuilt Fort George ($11.70 adults/$5.80 youth), I decided to take an evening Ghost Tour ($12 adults, $6 kids under 12). It was one of the most fun historical walks I’ve ever done. And yes, it was pretty darn scary. Not that anyone in our group of about 30 would have dared admit it. “We have a loose, no freakin’ out rule,” guide Peter Mitchell warned us as he led us through the fort’s giant wooden gate, with only a lantern to brighten the way. (The weekend tours quickly sell out in October, so it’s smart to make a reservation. Call 1-905-468-6621 or visit www.friendsoffortgeorge.ca/ghost.htm). During the two-hour tour under the stars, Mr. Mitchell related stories of footsteps where none should be heard, images of dead people in mirrors and whispery soldiers who still keep guard at the gate. We also traveled into a spooky, 70-foot-long tunnel that connects to two lookout towers just outside the garrison walls, and sat in total darkness in the barracks. Can you feel the hairs rising on the back of your neck? Thank goodness for the pint of Harp I enjoyed with my fish and chips at Irish Harp beforehand. By now, though, I had ghosts on the brain. So before heading back to my B&B, I stopped by the Olde Angel Inn on Regent Street, the oldest operating inn in Ontario, for a mug of Moosehead Pale Ale (I was in Canada, after all). Legend holds that the ghost of Capt. Colin Swayze, who was killed in the basement of the inn — either accidentally or on purpose, depending on who’s telling the story — during the American invasion of 1813, haunts the yellow frame building. I looked hard for a shadow on the hand-hewn exposed beams in the bar, and trained an ear for any footless footsteps on the 200-year-old plank floors. I even ventured downstairs to the ladies room, where Capt. Swayze reportedly has been spotted. But nothing. Guess I’d have to get my jollies the next day with a different kind of spirit: wine. With so many wineries within a 15 minutes drive of the historic district, a trip to Niagara-on-the-Lake isn’t complete without a wine tasting (or two). Wineries range from boutique-small (Lailey Vineyard’s tasting room isn’t much larger than the bar on which wine is served) to grand estates with on-site restaurants, such as the Peller Estates Winery. I was lucky to have a guided tour of one of the town’s founding-family wineries, Reif Estate Winery, which opened in 1982 and now grows more than 20 varieties on 125 lush acres. Being September, the sweet aroma of grapes, just starting to be harvested, greeted me at the door. Grapes don’t like wet feet, PR director Andrea Kaiser explained as she led me past the vineyards and into rooms where the grapes are de-stemmed, crushed and then pressed. But when the soil is full of red shale, like it is in this region, the fruit thrives. The fruit also doesn’t like cold air, which is why giant windmills loom in the distance. They keep warm air circulating over the grapes when there’s danger of frost. Grapes used in making Reif’s award-winning ice­wines, conversely, welcome the cold air, so long as the temperature doesn’t fall below about 6 degrees Fahrenheit. The winery presses this delicate dessert wine in a wooden screw press brought over from Germany. Wine goes perfectly with cheese, so my tour ended with a tasting of four wines paired with artisanal Canadian cheeses and some dense Niagara raisins for nibbling ($10/flight without cheese, $25/flight with). The Ermite Bleu served with the signature Vidal Icewine — made by monks in caves under the Abbaye St-Benoit Monastery in Quebec — provided the perfect tangy finish. Getting there:Niagara-on-the-Lake, Ontario, is on the south shore of Lake Ontario at the mouth of the Niagara River, or 14 miles north of Niagara Falls. It’s about a 41/2-hour drive from Pittsburgh (Interstate 79 north to Interstate 90 east to Interstate 190 north) You also can fly into Buffalo and rent a car, though keep in mind there are no direct flights. U.S. citizens returning from a trip to Canada by car have to show both proof of citizenship and proof of identity. So don’t forget either your passport, or a valid driver’s license and birth certificate. (Children under 16 only have to provide proof of U.S. citizenship.) You need a valid passport if you’re traveling by air . 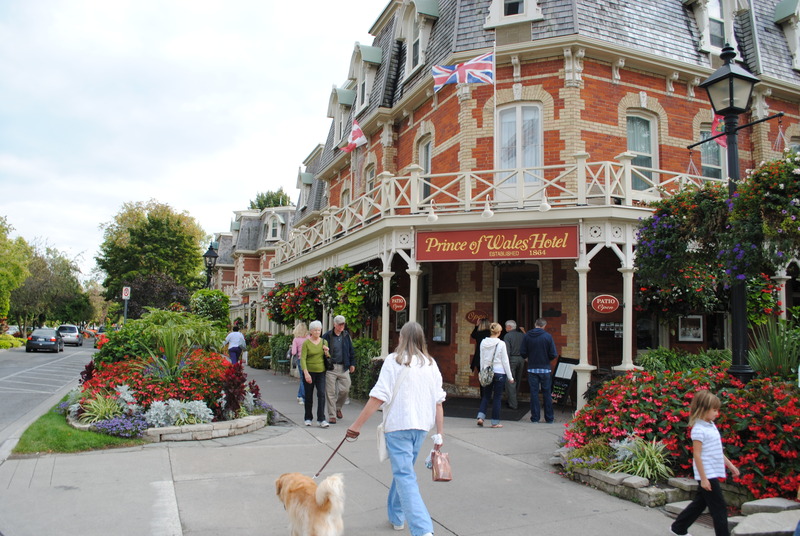 Where to stay: The Prince of Wales at the corner of Picton and King streets (www.vintage-hotels.com; 1-888-669-5566), established in 1864 and now part of Vintage Hotel Properties, is the town’s landmark hotel. But you’ll pay a pretty price for its Victorian-style luxury: traditional queen rooms start at about $275/night. Other choices include B&Bs, private vacation homes, boutique suites, small inns (the Olde Angel Inn on Market Street is said to be haunted) and budget motels like the Niagara Residence & Conference Center, where you can get a room for less than $99. The Chamber of Commerce makes it easy to find a room, offering a free accommodation booking service on its website. I tend to like historic properties so booked the Lace Room at the charming Skyehaven B&B ($130/night including breakfast), built in 1787 on the historic side of the lake and just a 10-minute walk from town. Where to eat: Depends on what you’re hungry for. One of the more elegant choices is the English high tea at The Prince of Wales, served daily from noon to 6 p.m., with sandwiches, pastries and scones ($32/person, $17 for children 12 and under). Or, treat yourself to a waffle cone filled with one of more than 30 flavors of ice cream at Cow’s Store on Queen Street. For dinner, don’t miss the fried haddock and chips ($11.95) at Irish Harp on King Street; it’s fantastic, especially if you wash it down with a pint of Harp ($6.73). What to do: The annual Shaw Festival, which includes George Bernard Shaw’s “The Doctor’s Dilemma” and Oscar Wilde’s “An Ideal Husband” through Oct. 30 at the Festival Theatre, is an obvious draw, along with sightseeing at Niagara Falls (the Maid of the Mist boat ride near the falls is open through Oct. 24). But there’s also shopping in the Heritage District, golf, biking along the Niagara Parkway and more than 20 wineries at which to sample Ontario wines. History buffs also can get a taste of living history at Fort George, which served as a British headquarters during the War of 1812 (there’s a ghost tour Sunday nights through October) or the Niagara Historical Museum. A note of caution: If you’re driving, be sure to bring plenty of change for parking. Metered parking is required seven days a week between 10 a.m. and 6 p.m., and ticket machines don’t take bills.